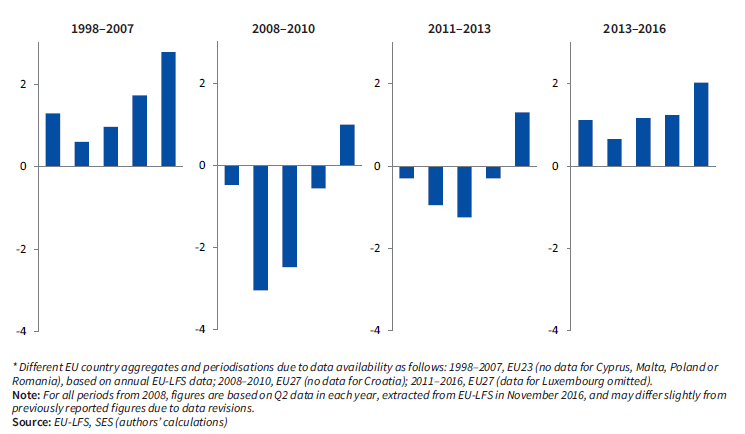 The European Jobs Monitor [EJM] tracks structural change in European labour markets. It analyses shifts in the employment structure in the EU in terms of occupation and sector and gives a qualitative assessment of these shifts using various proxies of job quality – wages, skill-levels, etc. The EJM covers all 28 EU Member States and is based primarily on analysis of European Labour Force survey data. The EJM methodology is adapted from the pioneering work of Joseph Stiglitz and Erik Olin Wright / Rachel Dwyer in the USA in the 1990s. Jobs, classified by sector and occupation, are ranked according to mean hourly wage; this classification is then used to study on a continuous basis the changes in the structure of employment in different countries, as well as at aggregate EU level. New EJM chart data for all member states (except Luxembourg) for 2011-16 can now be consulted interactively online. The latest EJM annual report 2017: Occupational change and wage inequality - published in June 2017 – discusses the role that occupations play in structuring European wage inequality, and the extent to which observed patterns of job polarisation and upgrading have contributed to wage inequality trends. One main conclusion is that occupational dynamics did not drive wage inequality developments in the last decade; within-occupation wage changes were a much bigger factor contributing to overall wage inequality than wage changes - or employment shifts - across occupations. Labour market recovery in the EU strengthens: There were eight million more people at work in 2016 Q2 in the EU compared with three years previously. Employment growth since 2013 has been only modestly skewed towards well-paid jobs. There has been robust growth in low-paid and mid-paid jobs as well, consistent with a consumption-led recovery. Strongest growth in well-paid jobs: Over a longer time frame (going back to the late 1990s), higher-paid jobs have continued to grow faster relative to those in the rest of the wage distribution. This has been the case in recessionary and non-recessionary periods alike. ... but a recent bounce also in (mainly good quality) manufacturing employment: There has also been an increase of 1.5 million in the manufacturing employment headcount since 2013. Most of this increase has been in engineering, professional and management jobs in the top wage quintile and not in more traditional, blue collar production roles. Proportionately, the EU13 countries (those that have joined the EU since 2004) have been the main beneficiaries of net new manufacturing employment. Ageing workforce: in many of the fastest growing large jobs, the share of older workers has increased significantly, suggesting that extended working lives and later retirement are important factors in explaining resilient recent employment growth. ... but there has been only a marginal contribution of occupational wage and employment change to recent shifts in wage inequality: Most of the changes in wage inequality between 2005 and 2014 were the result of changes in the distribution of wages within occupations, with changes between occupations playing a much less important role and changes in the occupational structure (job polarisation) playing a very marginal one.